For Valentine's Day my wonderful mother got me the movie Julie & Julia as well as the star item of the movie: Mastering the Art of French Cooking - the Julia Child cookbook. After browsing through the many sections and trying to decide what I wanted to make first, I finally settled on a chicken dish: chicken fricassee. We had friends over for dinner on Tuesday night so it was the perfect opportunity to try out a new recipe. 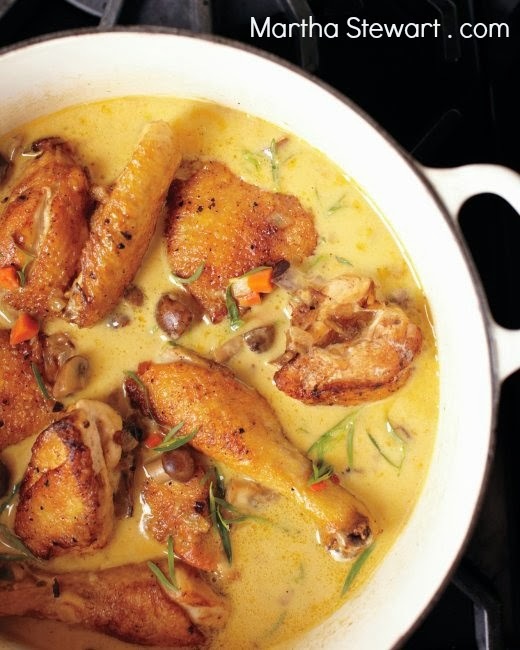 Chicken fricassee is kind of somewhere between a stew and a chicken with a creamy sauce poured over it. It's delicious and I highly recommend it. Season chicken on both sides with salt and pepper. Preheat a Dutch oven or other large heavy pot (I used a soup tureen) over medium-high heat. Add 2 tablespoons butter and 1 tbsp olive oil to the pot. Place the chicken (Julia says use a whole chicken cut into it's parts, I used 4 chicken breasts with bone in and skin on), skin side down, being careful to not crowd the pot. Turn the chicken and continue frying until golden brown on both sides, about 10 minutes then transfer to a plate. Repeat with remaining chicken. Reduce heat to medium, and add mirepoix (1 white onion, 1-2 carrots, and 2 stalks celery, all cut up as desired) to pot, scraping up any browned bits with a wooden spoon. Saute, stirring occasionally, until soft and golden brown, about 8 to 10 minutes. Add 8 ounces mushrooms, and cook until mushrooms darken, become glossy, and begin to release liquid, 4 to 5 minutes. *Or, if you're like me and dislike cooked mushrooms, skip this step completely. Stir in 2 tbsp flour, and cook until flour is absorbed by vegetables, about 1 minute. Add 1 cup dry white wine to the pot and bring to a boil, stirring until liquid just thickens. Add 3 cups chicken broth, and stir. Place chicken, skin side up, in a single layer on vegetables. Tie parsley sprigs, thyme sprigs, and bay leaf together and add to the pot. Bring to a boil, then reduce to a simmer, covering partially. Cook for 30 to 35 minutes (or until internal temperature of thickest part of chicken registers 165 degrees). In a separate bowl whisk together 2 egg yolks and 1/4 cup heavy cream (I used 18%). Whisking constantly, pour 1/2 cup cooking liquid, 1 tablespoon at a time, into this liaison (sauce thickener) to temper it. This will ensure the eggs don't cook and scramble. Stir the now tempered liaison into the pot. Add tarragon, 1 tsp lemon juice, 1 tbsp butter and a pinch of nutmeg. Bring to a simmer, stir gently to combine, and serve. This is what it looks like on the Martha website for reference. I forgot to take pictures during the cooking process so this is what it looks like while it's cooking and then my picture of it is the plated finale. I served mine with rosemary and olive oil roasted Parisian potatoes. I had to rush home to make dinner because I had spent the day learning. Learning how to take blood and how to start IVs. 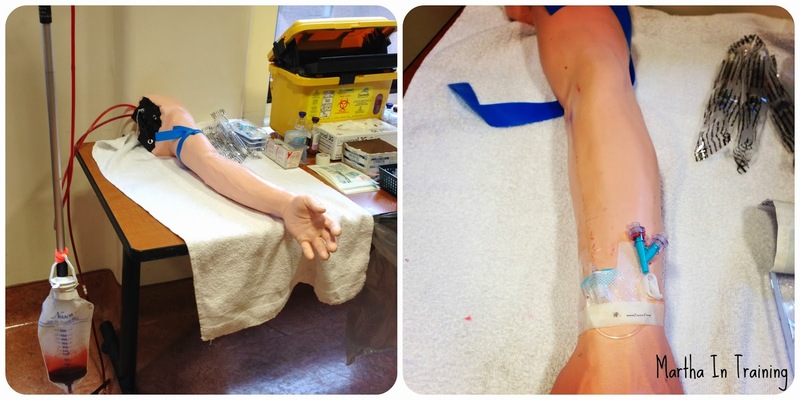 I was pretty successful on the dummy arm so here's hoping I have just as much luck on real people!